I had a different blog post planned for today about book covers – but it can wait. We can talk about book covers any time. And we will! I have written and published a number of essays since 2006. By essays I mean creative non-fiction. The truth. I did not start writing fiction until sometime around 2007 or 2008. Last week I decided to reestablish my connection with the Huffington Post. I blogged a bit for them back in 2008-2009 when they first launched a Chicago site. I emailed and asked for a new password, and figured this would be a good way to start, once again, writing about things other than writing. Writing some essays. Other venues popped to mind, but HuffPost would be first on my list. So I pulled out an old essay and dusted it off. It had homes on old blogs of mine, but never garnered very much attention and those blogs are long gone. I sent it to the powers that be at HuffPost who say yes or no and decide when and where something is posted. And my story was posted on the front page of the Huffington Post Divorce Section. Seems like a funny thing to kvell over, doesn’t it? Well, the funny part is, that AOL also picked it up and ran it on their front page. I started getting emails and texts from people who still use AOL and it’s actual website. And I started receiving emails from people I didn’t know. And notes on my author page on Facebook. People who were being kind and supportive and people who were saying they’d love to read my book when it comes out. At the time I’m typing this there are over 1200 comments on that HuffPost piece. I have only read a handful of them because it’s good practice for not reading book reviews. I would never, ever engage with commenters on a big site like Huff Post. I’m not there to argue about what happened to me almost ten years ago. Every word I wrote is true but not every bit of truth of my entire life is in one little essay. So my thought went to momentarily feeling bad that I’d been so honest. Icky things make people uncomfortable or angry or sad. Should I be stirring up emotions in strangers? Who did I think I was? While the story was mine, did that mean I had the right to share it? And then I got a grip on reality. I have a book coming out this Spring – and although it’s fiction – the seedling of the story was born in truth. I am not my main character nor do I have her problems – but it’s still honest in the sense that emotional truths come through in a happy scene or sad scene because an author can remember feeling or seeing something happy or sad. Or something sickening or startling or funny or poignant. And, I am thrilled to say, since my book will be available everywhere books are sold, this “having everyone able to see what the hell I’ve written” is probably something I should get used to. I remembered today — if we are ones meant to write our stories — the real ones or the make believe ones — we must write them loud and real. Write them big and full and explosive and relentless. Write them sad and scratchy and smelly and bleeding. Write the truth for yourself or the truth for your characters. You owe it to your readers — and yourself. If you want to read my story on Huffington Post, you can find it here. And you are right to share, also very skilful in doing so. But don’t read the comment, some of them are outrageous! ‘comments’ with an ‘s’ ! Oops ! Wow, Amy. Just wow. What a great reminder. Thank you for sharing! 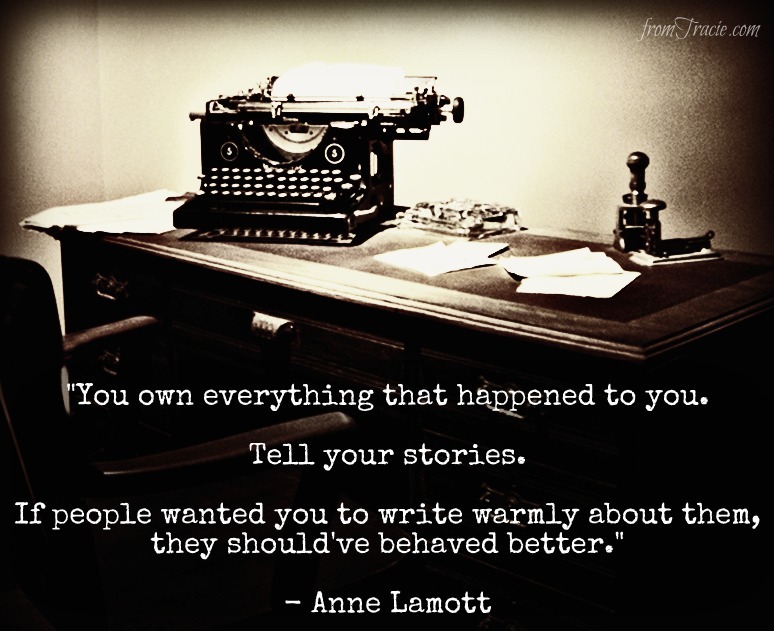 Thank you for the Anne Lamott quote which I had not seen before. And, like Melissa (above) my reaction was WOW. Well said. I don’t think your piece was icky or sad. Body image is something that every woman (and a lot of men) deal with. The part I didn’t like was the insinuation that your husband was solely responsible for your self-esteem; that “it was he who perpetuated the myth that my padded curves were the bane of his existence.” That’s all most of those people will ever know of your ex, and they’ll make a lot of unfair generalizations about him based on one stupid line he said ten years ago in the intimacy of his home. As you said here, “not every bit of truth of my entire life is in one little essay.” When I write about people I know, I try to provide as balanced a perspective as I can, and not cast anyone as a villain. Yes, it’s my story to tell, but it’s their lives I could be affecting. Brilliant post, Amy, and kudos to you for putting it out there. You touched many women, I’m sure (I’m one of them.) I’m proud to know you – keep putting it out there – it’s like a ripple in a pond, you have no idea how far it will go, and who will be effected by it. Isn’t that why we wanted to write to begin with? It was a great post, with no ick factor at all. I love this post, Amy, and your Huff post. Thanks for the reminder to keep my writing real. Left my own comment. It brought up things I often deny, but from a different perspective. What a great post, ASN! You answered your own questions brilliantly. Thanks for sharing. This is great, Amy! Love the Huff post – honest and thought-provoking – and I love all the buzz it created. Way to go! Brava. The thing about creative non-fiction is that it’s always truth as we see it, as it affected us. And that’s the only perspective from which we can write our experiences, isn’t it? In our fiction, we can try to dig into another’s head and perhaps learn from that digging. But in that one article, you spoke from your heart and your truth. It just happens to be a truth many of us recognize. Hence, the brava. Amen! Writing truthfully, soulfully–whatever you want to call it–is the only way to go… even when it’s hard. (I’m going to try to remember this, and your good words of advice, when my novel comes out at the end of the month and the comments/reviews come in.) Thanks for sharing! Love the quote by Anne Lamott. Thanks for sharing it and your experience. I definitely want to get into more essay writing, but always find it a bit tough to be completely open about some things. Yet, the essays I read where people are truly authentic about their feelings and experiences are the ones I’m most drawn to. So, I’m working on it. Well, Amy, you certainly touched a raw nerve with a lot of readers with your HuffPo piece–and I’m one of them! We’ll have to chat when we meet 🙂 Meanwhile, yes, you’re right that these sorts of personal essays resonate with many, many readers. I’ve been writing for HuffPo for many years, as well as writing personal essays for women’s magazines for nearly a quarter century. I once had a literary writer pal say, “Don’t you feel like such a hack when you write for those sorts of places?” The answer was NO. I love connecting with people around the country–even around the world–and many more people read magazines and newspapers than novels, so writing essays is a great way to do that. Good for you. Amy, I loved your Huff Po essay! When I read it, there were only several comments at that point, and I remember thinking: Huh? Did they read the same essay I read? It was a good reminder to me as a writer that I can put something out there, a novel, an essay, and once it’s out there, everyone will have his/her own reaction/interpretation. I thought your piece was so powerful/empowering! It takes a lot of guts to put yourself out there. Kudos to you and all other writers who take those risks. I read the post last week and immediately linked to it on facebook. I loved it –your writing definitely stirred raw emotions. I read and loved that post last week, Amy. I didn’t leave a comment becaues by then you were over 1,000 strong in comments. Glad you put it out here and gave all of us a chance to respond in a more personal way. It takes guts to get to the raw emotions we try to hide. I hid mine for yhears behind humor or sarcasm … I tried to tell myself no one would be interested anyway because I wasn’t going to be the next literary genius. Why bother with genre writing? Why bother? Because of all the things you said and because its the best way to cut through the layers and find who we really are. Readers will know who you really are and love your work for being real. Amy — I remember that piece from the online class we took together in 2006-7. I’m so glad to see it have such a huge response once you introduced it to the world through the power of social media! This is incredible, and you are awesome. Rock on, friend. That’s great! I love the post (this one AND the one on HuffPo)! Way to go, and a great reminder. Wonderful blog and essay. Loved them both. I’ve always said I hide behind fiction. But you’re correct that even fiction, when done right, tells uncomfortable truths. Write on. Read your essay, Amy, and it was brilliant. I struggle with my weight issues, too (I long for those days when I was a size 7 and could eat anything I wanted! ), but I’m so very, very blessed that my husband loves my curves. I am glad you are no longer with that man as he didn’t appreciate you for who you were. I admire you more than ever, Amy. Thanks for telling your courageous and touching story. Thanks for helping us all retain our sanity in a maelstrom of public commentary. A good point to remember is that often comments aren’t really about you and your life, but rather about the unresolved issues in the commenter’s life that your writing brought to the surface. The better your writing, the more this is apt to happen.